DETROIT, Feb. 7, 2017 /PRNewswire/ -- DTE Energy customers will soon be able to reduce their carbon footprint while supporting clean energy sources. Starting in April, customers will have the opportunity to buy more of their power from wind and solar farms – two of the most affordable clean energy sources available - through MIGreenPower. 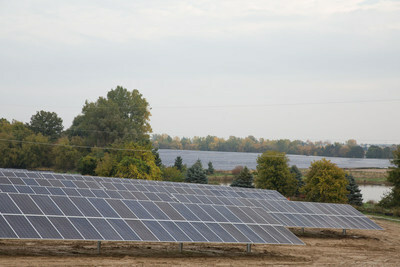 "Until now, customers who wanted to use more renewable energy were limited to installing their own solar panels or other renewable equipment at their homes or businesses – which requires a significant initial investment," said Irene Dimitry, vice president of Business Planning and Development, DTE Energy. "We also know that customers who rent apartments or live in condos may be unable to make any alterations to the exterior structure of the homes they live in. MIGreenPower is designed to address customer demand for a more flexible and affordable alternative." Energy for the program will be sourced from the Pinnebog Wind Project, located in Huron County, and three solar arrays located in Detroit and Lapeer. By subscribing to MIGreenPower, customers can elect to increase the amount of renewable energy they use in 5 percent increments, up to 100 percent. Selfridge Air National Guard Base, the nation's largest and most complex base operated by the Air National Guard located in southeast Michigan, has already expressed interest in being one of the program's early adopters. "We are looking carefully at this program," said Brigadier General John Slocum, the Base Commander. "We think it can provide us with a means to meet our sustainability goals efficiently and economically. We are excited to know that DTE is bringing this type of opportunity to its customers in Michigan." "This type of program further spreads awareness of the viability of renewable energy in a way that also makes sense for the energy bill," said Rob Threlkeld, GM's global manager of renewable energy. "We'll look at programs like this as we work to meet our goal of meeting the electricity needs of GM's global operations with 100 percent renewable energy by 2050." Participation in this program is purely voluntary and is open to all of DTE's 2.2 million full service business and residential electric customers. Customers who want to participate in MIGreenPower will see a slight increase to their monthly bill depending on the level of renewable energy they select. For example, a typical residential customer who subscribes to an additional 25 percent renewable energy might see a net increase of as little as $5 per month to their bill while knowing they are helping to support Michigan's clean energy future. A calculator on the program website will help customers see how their monthly bill will change as well as the corresponding positive environmental impact. For more information on the program and the enrollment process, please visit dteenergy/MIGreenPower.com or call 855.613.4445. DTE is Michigan's largest investor in renewable energy, including wind and solar, having driven investments of more than $2 billion in renewable energy since 2008. In 2016, more than 10 percent of the energy provided by DTE was generated from a renewable source in Michigan – enough clean generation to power nearly 450,000 homes. Today, DTE's renewable energy portfolio includes 13 wind parks and 28 solar arrays in Michigan. DTE Energy (NYSE: DTE) is a Detroit-based diversified energy company involved in the development and management of energy-related businesses and services nationwide. Its operating units include an electric utility DTE serving 2.2 million customers in Southeastern Michigan and a natural gas utility serving 1.3 million customers in Michigan. The DTE Energy portfolio includes non-utility energy businesses focused on power and industrial projects, natural gas pipelines, gathering and storage, and energy marketing and trading. As one of Michigan's leading corporate citizens, DTE Energy is a force for growth and prosperity in the 450 Michigan communities it serves in a variety of ways, including philanthropy, volunteerism and economic progress. Information about DTE Energy is available at dteenergy.com, twitter.com/dte_energy and facebook.com.